Karl Shreeves, MA, is Technical Development Executive for PADI (Professional Association of Diving Instructors) and DSAT (Diving Science & Technology). He designs and develops diving, marine science and CPR/first aid instructional materials as a writer, commercial photographer and subject matter expert, with numerous credits in PADI, DSAT and Emergency First Response print and online publications and videos. These include contributing to the development of many PADI courses, and the PADI/DSAT TecRec technical diving program, and contributing as a writer and editor to the Life on an Ocean Planet marine science high school curriculum from Current Publishing. He has also been a contributing editor, columnist and feature writer for magazines such as Sport Diver, Skin Diver Magazine, Scuba Times, aquaCorps, Immersed, Discover Diving and Deep Tech. Currently, he is Education & Technical Editor of The Undersea Journal, as well as contributing writer/photographer. 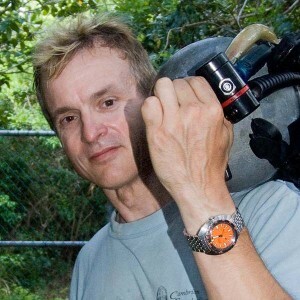 An avid cave and technical diver, Shreeves is active in diving for science, and has taken part in several research expeditions, including the Farb Monitor Expeditions, Project Nohoch, and the Cambrian Foundation North Florida Springs Project, Akumal Expeditions and Bermuda Projects. Shreeves has been part of the NASA NEEMO support team, which studies human spaceflight dynamics in an underwater habitat, saturation environment, since 2001. He is presently a Research Diver and Diving Safety Control Board member for the Cambrian Foundation. Most recently, he assisted Cambrian Foundation founder and noted tech diver Terrence Tysall with marine speleobiology in Bermuda, and with the Foundation’s ongoing underwater cave biological survey in north and central Florida. In addition, Karl was the recipient of the Cambrian Foundation’s 2008 Giant Stride Award.